SEBASTIAN – One of the longest running festivals in Sebastian has been the Clambake, which will kick off its 2017 seafood menu with chowder and steamers for an eventful weekend starting Nov. 3 through Nov. 5 at Riverview Park. The hours for the Clambake will be Friday 2-9 p.m., Saturday 10-9 p.m., and Sunday 10-5 p.m. The Sebastian Clambake Festival 2017 will carry the “American Runs On Clams” slogan, which was announced in May. 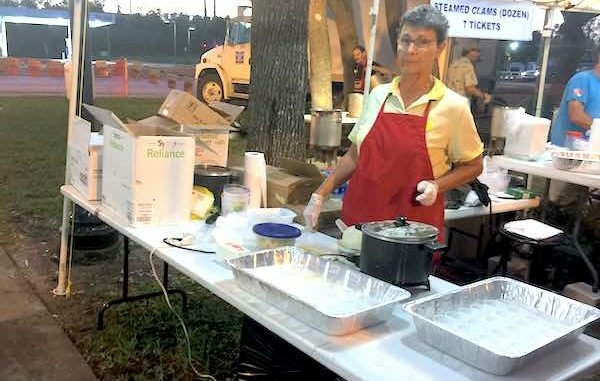 15 years ago, Rich Stringer and local volunteers put together the first Clambake in Sebastian. One of the those volunteers was John A. King of RE/MAX Crown Realty. Featured seafood items include the traditional clam chowder, steam clams, clam strips, and shrimp. And the crab cakes will make a return by popular demand. 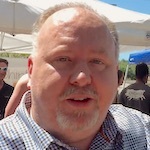 The cakes debuted during last year’s clam festival. Non-seafood lovers can also enjoy sausage and peppers, hot dogs, and pizza during the weekend event. There will be plenty of live music by The Mixers, Danny Morris Band, Lost in Da Mail, Ladies of Soul, Wiley Nash Band, Soul Jam and Beatle Guys. The Sebastian River High School Drumline will also be performing. Locals can also check out the Sebastian Police K-9 Unit. DJ SHHH OP will also be spinning the tunes during the weekend. The Sebastian Clambake Festival 2017 will also feature craft beer with two batches of brew made exclusive for the event. ClamaJama IPA and Digger’s Golden Ale will be produced by Pareidolia Brewing Co. and sold. Other drinks include Smirnoff Ice, Not Your Father’s Root Beer, Not Your Father’s Mountain Ale, O’Doul’s non-alcoholic brew and sodas. Car enthusiasts can also find the “Sebastian Muscle Cars” set up along the rivers from 10:30 a.m. to 4:00 p.m. Saturday. All Clambake proceeds and seafood sales are distributed to community-based organizations for capital improvements or program grants. The Clambake Foundation members approved $2,500 program grants for seven organizations, including the Ecumenical Food Pantry; The River Fund; Sebastian River High School’s Chum Bucket program; the Prasad program; SOS Cookies; Sebastian United Methodist Church’s Music Camp; and the GFWC Sebastian Jr. Woman’s Club’s Science Camp. Since the beginning of the Clambake, the foundation has given away more than $675,000 to beneficiaries in the community. For the Sebastian Clambake Festival 2017, capital grants will be given to the Economic Opportunities Council; Sebastian Soccer Association; Roseland Ecumenical Food Pantry; Sebastian River High School’s Rowing Club; St. Sebastian Catholic Church; Kashi; and the Treasure Coast Rugby Foundation.